A dose of selfish honesty for everyone on this Friday: part of the reason I enjoy photographing homeless people so much is that I often feel like I’m helping individuals by providing a listening ear. It feels good to know that maybe, just perhaps, I helped brighten someone’s day. In a community where people have often been conditioned through various circumstances to feel insignificant, it's nice to be able to remind individuals that they are significant and that their stories matter. Late yesterday, a cloudy, rainy evening in Boulder, I experienced something I hadn’t before while approaching strangers for portraits. 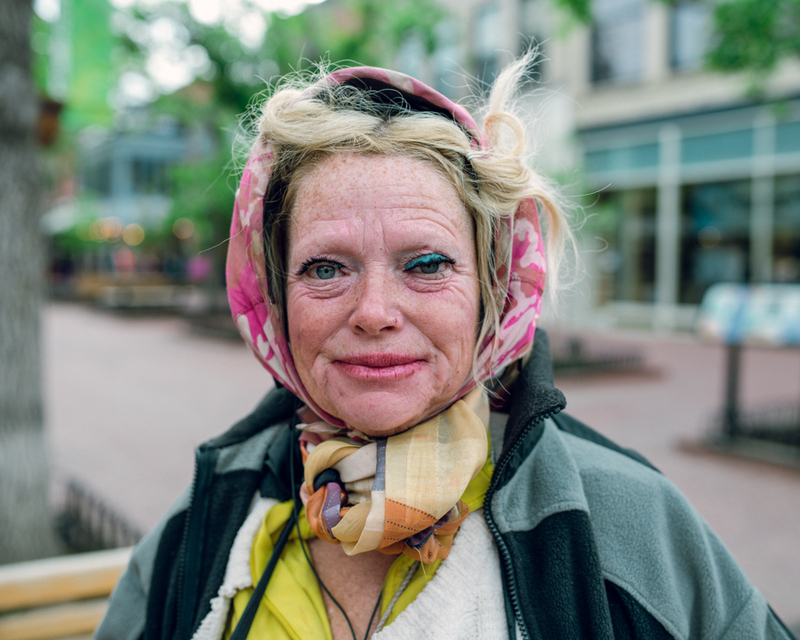 The woman pictured below is a fixture here in downtown Boulder. She sings and hits a rubber-headed drum with loosely gripped drumsticks on one of the street corners of the Pearl Street Mall. She also appears to be extremely mentally impaired. First reactions to her loud, screechy, off-pitched singing and wild appearance are often laughter. I’ll admit that was my reaction as well. But it doesn’t take long to realize this isn’t a joke for her. When I approached her, she smiled and allowed me with welcoming gestures to take a few photographs, but was unable to articulate any sort of response to my questions. Her only words involved – with a blank look in her eyes – repeatedly offering me some small apples that she had for sale. I'm not sure she knows her own name. To say that this encounter was disturbing would be an understatement. Maybe it’s because it hits so close to home. Maybe it's the way people so predictably avoided walking near her and exchanged uncomfortable glances with others passing by. Or perhaps it’s because for the first time, I had to walk away without having any idea what I could do to help this woman. Regardless, I thought this was an experience worth sharing. In "Boulder", "Colorado", "D800", "Nikon", "Pearl Street Mall", "Replichrome", "portrait"